Windows 10 updates are mandatory, you already know that. At least that’s what Microsoft wants you to believe in. But besides regular system stability updates, Windows Update usually brings regular updates for other Windows features. One of the features that receives updates on a relatively regular basis is dotNet Framework. However, not everything goes so smooth for some users when installing dotNet Framework updates. Namely, an issue that bears the code 0X800f081f may occur when you’re trying to update this feature. So, if this bothers you as well, we’ve prepared a few solutions that, hopefully, will resolve the problem. Windows Update error 0x800f081f Windows 7, 8.1 – This error can appear on older versions of Windows, and even if you don’t use Windows 10, you should be able to apply most of our solutions to the older versions of Windows. 0x800f081f .NET 3.5 Windows 10 – If you can’t install updates due to this error, the problem might be .NET Framework. To fix the problem, simply enable .NET Framework or use an offline .NET installer. 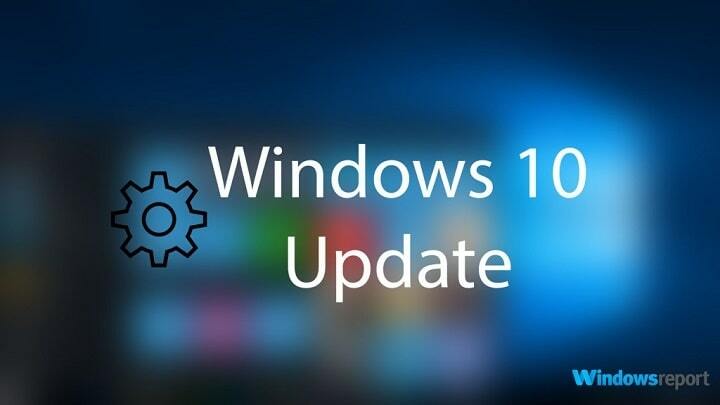 0x800f081f Windows Update core, agent – This error can affect other Windows Update components, and in order to fix the problem, it’s advised to reset all Windows Update components using the Command Prompt. 0x800f081f Surface Pro 3 – This issue can affect Surface Pro and other laptop devices. If this happens, you should know that all of our solutions can be applied to laptops, so don’t hesitate to try them out. Search for the latest offline dotNET Framework installer on the web. Download the installer and start the process. The installation can take some time before the files are ready to install. Follow the instruction and, after the procedure is finished, restart PC. Make sure that you are using an official Microsoft version from the verified site. Press Windows Key + X to open Win + X menu. Now choose Command Prompt (Admin) or Powepowrshell (Admin). SFC scan will now start. Keep in mind that this can can take up to 15 minutes, so don’t interrupt it. Once the scan is finished, check if the problem is resolved. Don’t forget to change C:RepairSource with the location of your repair source. Once the process is finished, restart your PC and try updating again. Once the DISM scan is finished, check if the problem is still there. If the issue is still present, or if you weren’t able to complete the SFC scan, be sure to repeat it now and check if that solves the problem. First, you need to visit Microsoft’s Update History website in order to find out the update number. You can easily compare your update history and the information on the website in order to find the missing updates. Once you find the update code, it should start with KB and be followed by an array of numbers, you need to visit Microsoft Update Catalog page. Enter the update code in the search field and the list of results should appear. Keep in mind that the list will show you updates for different architectures, so be sure to select one that matches your system architecture. Once you download the update, simply run the setup file to install it and that’s it. As you can see, downloading and installing updates by hand can be a bit complicated, but you should be able to do it by following these steps. Keep in mind that this process won’t fix the error, and instead it will allow you to circumvent it and download the update. After running the commands, check if the problem is resolved. If you don’t want to manually run these commands, we wrote a short guide on how to create Windows Update reset script, so be sure to check it out and find out how to automate this process. Press Windows Key + S and enter windows features. 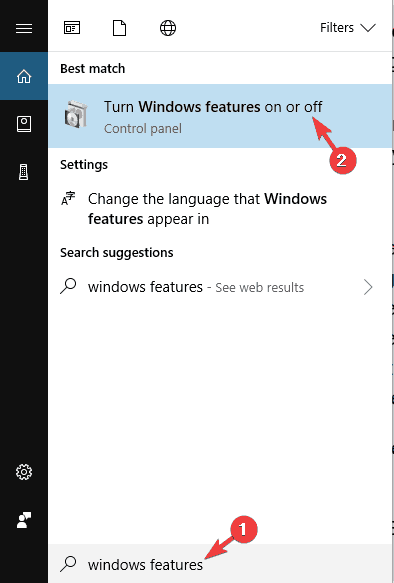 Select Turn Windows features on or off. Windows Features window will now appear. 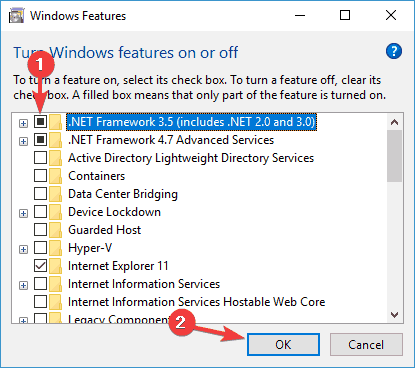 Make sure that .NET Framework 3.5 is enabled. After enabling it, click OK.
After enabling .NET Framework, try to perform the update again and check if it works. Now select Troubleshoot from the left pane. In the right pane, select Windows Update and click Run the troubleshooter. Troubleshooter will now start. Follow the instructions on the screen to complete it. Once the troubleshooter is finished, check if the problem with Windows Update is resolved. 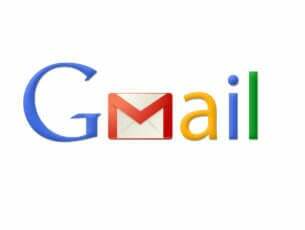 If you’ve tried previous solutions and haven’t succeeded, we advise you to perform the clean reinstall. That way you’ll surely fix any given issue. Namely, the upgraded system is much more sustainable to errors than the one installed on the formatted hard drive. Open the Start Menu, click the Power button, press and hold the Shift key and choose Restart from the menu. List of options will appear. Select Troubleshoot > Reset this PC > Remove everything. If you’re asked to insert installation media, be sure to do so. Select Only the drive where Windows is installed > Just remove my files. Click the Reset button and follow instructions on the screen. Once the process is done, you’ll have a fresh installation of Windows 10. That should wrap it up. In case you have any suggestions or remarks, feel free to tell us in the comments section below.